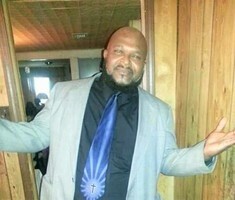 Provide comfort for the family of Victor Holley with a meaningful gesture of sympathy. Provide comfort for the family of Victor Leverne King Holley by sending flowers. Dearest Family, my deepest sympathy goes out to each of you. More than 25 years ago I was "adopted " into the Family. Whenever we'd drive up we'd expect Vic to be sitting on the porch, "fussing " (LOL) at nothing or no one in particular. We're all gonna miss Victor and forever love him. The Lord decided it was time for the pain to stop so HE called him home to be with Glo, his loving Mom and his favorite Uncle, Floyd!! I pray that God will grant each of us strength and comfort during this difficult time. So Family and friends join me in remembering the family gatherings, Birthday/Anniversary celebrations, cookouts and Sunday dinners with Victor's voice and infectious laughter at the center of it all. With much Love and Gratitude. God Bless !! !